Whitney specializes in coaching beginner athletes, and integrates nutrition, yoga, and strength training to help athletes work towards their goals, have healthy relationships with their bodies, and stay on the path of fitness. She is always learning innovative ways of coaching and loves to personalize coaching to fit your needs. Whitney Lindsley​ (RRCA) loves to coach and build quality relationships with her athletes. 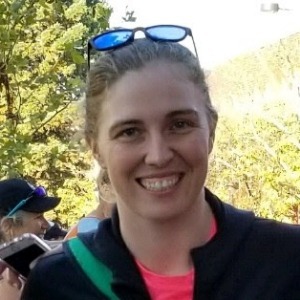 She has completed many 5Ks, 10Ks, and half marathons herself, as well as short-course (age group winner) and long-course triathlons, including Ironman. Whitney is a certified yoga teacher (RYT200 as of March 2019) and specializes in coaching beginner athletes, and integrates nutrition, yoga, and strength training to help athletes work towards their goals, have healthy relationships with their bodies, and stay on the path of fitness! She knows how hard it is to start the journey and stay in shape and wants to help you reach your goals and athletic potential through smart training.